St Fiacre is often invoked for healing of cancers and venereal diseases. He is also the patron saint of gardeners and taxi-drivers. 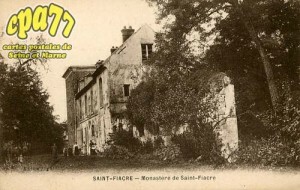 St Fiacre had a monastery in Ireland at Cill Fiachra (Kilferagh), Co Kilkenny, and later in France. He is often invoked for healing of cancers and venereal diseases. He is also the patron saint of gardeners and taxidrivers. Patrick Duffy explains some of these strange coincidences. Though not mentioned in the earlier Irish calendars, Fiacre was born in Ireland at the end of the sixth century. He was raised in a monastery where he became a monk and imbibed knowledge of herbal medicine. In time he had his own hermitage and perhaps a monastery, possibly near St. Fiachra’s Well at Cill Fiachra (Kilferagh), Sheastown, in the barony of Shillelogher near Bennetsbridge, Co Kilkenny. As crowds flocked to him because of his reputation for his holiness and cures, he sailed to France in search of greater solitude. When he arrived at Meaux in 628, the bishop St Faro, well-disposed to him due to kindnesses he and his father’s house had received from the Irish missionary Columbanus, granted him a site at Brogillum (Breuil), in the province of Brie. Faro offered Fiacre as much land as he could turn up in a day. 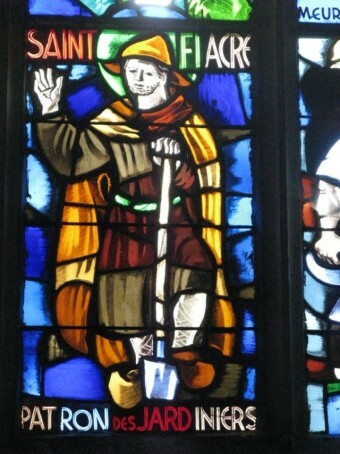 Fiacre, instead of using a plough, turned the top of the soil with the point of his staff. He then cleared the ground of trees and briers, made a cell for himself, a garden for herbs and vegetables, a chapel and a hospice for travellers. All this developed into the village of Saint-Fiacre. It is situated in Seine-et-Marne départment of the Île-de-France region. Again in time the crowds flocked to him in search of cures. He died around 670. Fiacre gained a reputation and is invoked for the healing of fevers, tumours, cancers, as well as fistula and venereal diseases. He has become the patron saint of gardeners. In 1999 a garden in his honour was made at the National Stud in Kildare. It has become a major tourist attraction. Fiacre is also the patron of taxi-drivers. The Hôtel de St-Fiacre, in the Rue St-Martin, Paris, in the middle of the seventeenth century was the first to hire out coaches. The sign of the inn was an image of the saint, and the coaches in time came to be called fiacres.